Family members and the community are still reeling from the death of a man they say served his country and his neighbors. William Dean Poole had lived in the Wedowee Lane mobile home park south of Gastonia for almost 30 years. He was shot to death by police responding to what they described as a psychiatric call. Officers said they arrived to find Poole sitting on his riding lawn mower in his front yard. After police identified themselves and began approaching, the officers claim he pulled out a gun and opened fire. Four unidentified officers shot back, killing the man. Jeff Poole says his uncle talked frequently about his time in the U.S. Navy. More disturbing is the fact that this is the 3rd police shooting in Gastonia, NC, 19 miles west of Charlotte. In early February, another NC war veteran was shot and killed by a Gastonia police officer when the officer forcible broke into his home to preform a welfare check after concerned family members called police worried because the 74-year-old had just underwent surgery. 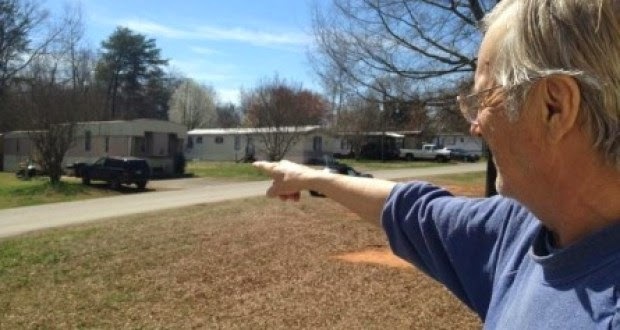 In late February, Gastonia Police shot a mother of two after she called them for help removing unwanted guests from her home.